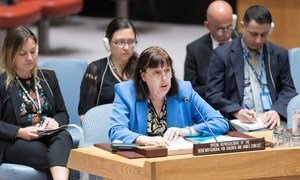 Reacting to a recent upsurge in violent attacks affecting children, Virginia Gamba, the Special Representative of the Secretary-General for Children and Armed Conflict, on 17 August 2018 called for those responsible to be held fully accountable. © UNICEF/Kamal Ayyashi | On 9 June 2018 in Yemen, an injured girl is being treated at Althawra Hospital in Hudaydah. She was injured along with her brothers and her uncle, while the family was trying to relocate farther from the fighting that same day in Aljah area, Bait Alfaqih district, Hudaydah. The last two weeks have seen a suicide attack on an education centre in Afghanistan which killed and injured young students in class, 21 children killed in Yemen when their school bus was hit by an airstrike, and ongoing child casualties in Syria – particularly in the conflict zones of Idlib and Western Aleppo in the North of the country. In recent days several UN Agencies have strongly condemned the attacks. The UN Children’s Fund UNICEF described them as a “war on children”, whilst the UN Human Rights Office OHCHR, pointed out that the Yemen strike was just the latest example of the children being killed in the country’s violent years-long conflict. (SOURCE: UN).